In January 2018, Netflix announced that it had crossed 54 mn subscribers in the US (i.e. 1 in every 2 US households). Netflix achieved this within 10 years of the launch of its over-the-top video streaming services (OTT). The rise of OTTs coupled with a significant decline in data cost has the potential to disrupt the media landscape in India. All players in the value chain are likely to be affected – distributors (Tata Sky / Dish TV), broadcasters (ZEE / Star), content producers (YRF / EROS / Saregama), and exhibitors (PVR / Inox). The short-term impact may not be visible as the Indian media sector is a growing market driven by favourable demographics, a rise in consumer income and a huge demand for knowledge, escapism, sports and news. However, over the long-term, OTT-led disruption could lead to some traditional playersin the value chain ceding significant share to the new age players unless they change their business models.Some of these OTT platforms in India have already reached a critical scale (Hotstar is estimated to have over 75 mn monthly active subscribers). However, the numbers are stillnowhere near the number of cable households inIndia (~190 mn). One key constraint in the mass adoption of OTTs in India is inadequate infrastructure (low wired broadband and smartphone penetration). In the developed world, OTT is primarily consumed on wired broadband and on TV screens. Indian households have a less than 10% wired broadband penetration. However, with the data revolution triggered by Jio, Indians are increasingly consuming OTTs on wireless broadband and smartphones. 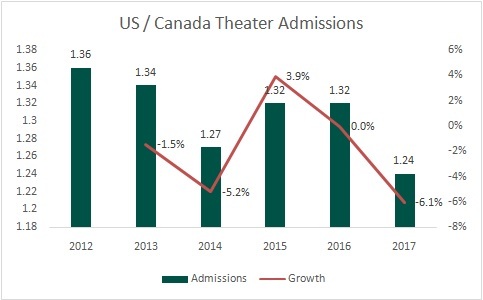 Movie theatre attendance in North America is on a declining trendand hit a 25 year low in 2017. On the other hand, Netflix’s streaming subscriber base in the US has more than doubled in the last 5 years. It is feared that the rise of OTT coupled with quality television and rising ticket prices is leading to a secular decline in movie attendance. Netflix’s strategy of producing films exclusively for streaming without a theatre run may also be impacting footfalls. Rise of OTT platforms could have a similar impact on theatre footfalls in India. Indian viewers can now choose from a large library of films (both new and old) on various OTTs and watch their favourite film at a convenient location and at their preferred time. The one big challenge for global OTTs was how to become relevant in a country where 87% of the total box-office collectionsaredriven by non-English movies. Over the last two years, Netflix and Amazon Prime have tried to address this gap by significantly increasing their local movie content. Domestic OTT platforms like Hotstar have a clear lead here with higher local language content. The comparison between OTT and theatres has become even more relevant with the reduction in the telecast restriction window between the theatrical release and digital release. OTTs are buying the digital rights of the latest Indian movies at exorbitant prices. “Padmaavat” recently released on Amazon Prime within 60 days of its theatrical release and even before a satellite release. It is now possible for viewers to delay theatre consumption of a movie by only a few weeks to watch it at a fraction of the cost with the entire family. PVR understands this threat and is negotiating with key movie production houses to extend the period between the theatrical release and digital release. In this interview with Anupama Chopra, leading movie producers too acknowledge the OTT threat to the Exhibition business. Ekta Kapoor expects the cost conscious Indian viewers to consume more and more movies digitally and visit the theatres only for the big event films (like Baahubali). In India, the cost of watching a movie in a multiplex has been increasing every year due to cost inflation and an unfavourable tax regime (GST rates at 28% and LBTs in some states). A Netflix subscription at Rs 200 per license per month (Rs800 for 4 licenses), Amazon Prime at Rs 50 per month (Rs600 for a year), Hotstar at Rs 100 per month and Voot for free are all cheaper alternatives than the cost of a single movie ticket. The cost-conscious viewer now has the option to consume copious amounts of movie content at a much cheaper rate.Several OTTs also operate on a freemium model where a large number of movies are available free of cost. As multiplexes look to expand beyond the metro cities in the cost-conscious Tier 2+ cities, they will need to price their tickets aggressively to compete effectively against the OTTs. In order to tap the OTT opportunity, all large broadcasters have set up their own OTT platforms (Zee – Zee5, Star – Hotstar, Colors – Voot). While Zee5 and Hotstar are on a freemium model, Voot is free (advertising driven). They have the advantage of ready content (both legacy and currently airing) that they provide on their OTT platforms. In addition, they are spending heavily on creating exclusive digital content. With more than 65% of the Indian population below 35 years, the broadcasters risk losing the younger viewers to OTTs like Netflix/Amazon if they do not make relevant content. In the developed countries too, TV viewing has fallen sharply especially among the younger viewers. Competition from global OTTs is likely to force broadcasters to increase their investments in developing youth-oriented content. In India, broadcasters’ business models are dependent on ads (70% of revenues). As broadcasters lose their customers to OTTs, there is bound to be a shift in advertising dollars from TV to digital. Digital is already 17% of total advertising spends in India and is expected to be 22%9 of total spend by 2020. Till now the market share gains have come at the cost of Print, with TV advertising dollars remaining intact. According to eMarketer, for the first time since the 2008 recession, TV ad spending in the US has declined 1.5 percent in 2017. It’s expected to decline another 0.5 percent this year and 1 percent in 2019 — three straight years of TV ad-spending drops. It remains to be seen if TV advertising budgets in India (growing till now)follow a similar trajectory. In a race to acquire the maximum number of subscribers, the broadcasters currently have little focus on monetization of their OTT platforms. A large part of the OTT content is free even in the freemium model. As data becomes cheaper by the day, broadcasters may see some cost-conscious customers shifting their consumption from cable TV to OTTs. In the long term, it remains to be seen whether their own OTT monetization make up for the decline in revenues from cable subscribers. 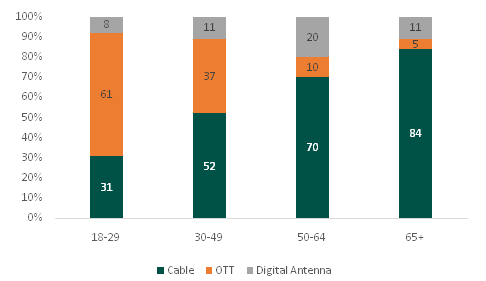 In the 18-29 age bracket, 61% of the respondents already use OTT as the primary way to watch Television. This trend is especially important in the Indian context where a majority of the population is under 30 years of age. Before the advent of OTT and low-cost internet, media distribution in India was the monopoly of distributors (Digital Cable/DTH players). However there has been an erosion in their value proposition with the emergence of OTT platforms. Cheap internet is accelerating the shift to OTT by emerging as a credible alternate pipe for consuming this media. As broadcasters shift their users to their own OTTs (Hotstar, Voot, Zee5), the role of distributors is likely to be further diminished. The resultant decline in the bargaining power with broadcasters will hurt the already poor economics (one of the lowest ARPUs in the world) of digital cable. India already has a high cable penetration of ~190 mn households out of a total of 240 mn households. The scope for further penetration is limited for the cable / DTH players. There is also a threat to the growth that was expected from nuclearization of families and from second television connections. As the working youth move out of their homes, they may look at OTTs as their primary connection. Similarly, there is a good chance that OTTs may become the second screen in families that would otherwise have taken a second cable connection. Despite their large content budgets, creating content for the diverse Indian audience might still be the biggest challenge for global OTTs. India is a collection of several disaggregated viewer sets with varied tastes depending on language spoken, literacy levels and exposure to western content. For eg. Hindi / English is only spoken by about ~55% and ~15% of Indians respectively. Therefore, content has to be customized for smaller groupswhich reduces the addressable market size. This has resulted in the inability of producers to invest heavily in creating great content (movies or shows). This is unlike North America which has a more homogenized domestic target audienceas well as a large global audience. It remains to be seen if global OTTs can replicate their success in creating exciting original English content in Indian languages as well. Exhibitors and Cable/DTH: We believe that the OTTs pose an immediate threat to players who act as content distributors only – cable/DTH and exhibitors. The OTTs are acting as alternate pipe for both movies and TV content whose distribution was till now a monopoly of cable and exhibitors. Also, they are now releasing original movies exclusively on their platforms. Broadcasters:The broadcasters have an opportunity to capture a large slice of the OTT market by offering their entire content library on OTTs. They have an inherent strength in non-English content that they can leverage to garner subscribers. But they will need to create original youth-oriented content to compete effectively with the global OTTs. There will be a transitory pain as they forgo monetization of their OTT platforms in a bid to garner the maximum subscriber base. It is unlikely that any of the platforms will make money in the near term as they compete to get more and more subscribers. It is also unlikely that the competition will subside in the near term because for some players like Amazon Prime and Jio, their OTT foray is more about driving footfalls to their core business (E-Commerce and Telecom). They will continue to invest aggressively for a long time without focus on core profitability of the platform. First and foremost I would like to convey my heartfelt appreciation to you for the highly insightful and enlightening article intituled “OTT Disruption In The Indian Media Sector”, but I would like to add that a few cogent and succinct points apropos average monthly data costs (in addition to the content cost , which you have mentioned and is also available on the respective OTT platforms) , would have been highly beneficial in analyzing the economics of the OTT platforms vis-à-vis the traditional media, especially in an exponentially parsimonious society .